In 2017, Slator launched our highly successful SlatorCon events series, with London, New York, and Zurich taking center stage last year. In 2018, we will kick things off in Tokyo, before moving on to London in May and San Francisco in September. 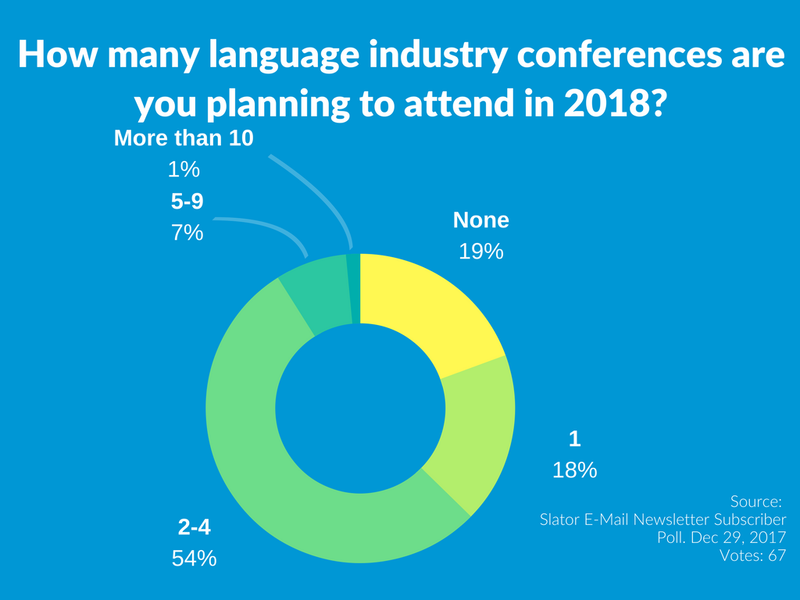 The majority of respondents to our weekly informal poll will likely attend one to three language industry conferences this year. More than half (54%) said they plan to attend two to three events, while almost a fifth (18%) said they would probably sign up for at least one event. More than just learning and networking opportunities, these conferences have become part of the annual travel plans of industry executives and an essential part of doing business. Around 7% of respondents are, however, more enthusiastic and said they would attend at least five to seven conferences this year. Meanwhile, 1% of respondents are taking these gatherings very seriously, saying they would at more than 10 conferences. 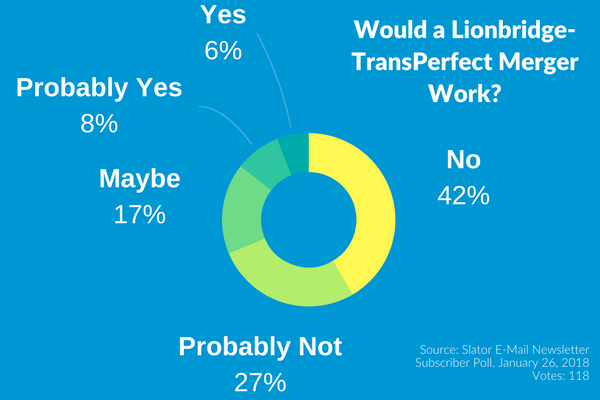 This is consistent with an earlier poll we ran in December where Slator’s newsletter subscribers expressed optimism on the industry’s prospects in 2018. At the other extreme, almost a fifth (19%) of respondents said they do not plan to attend any conference at all. 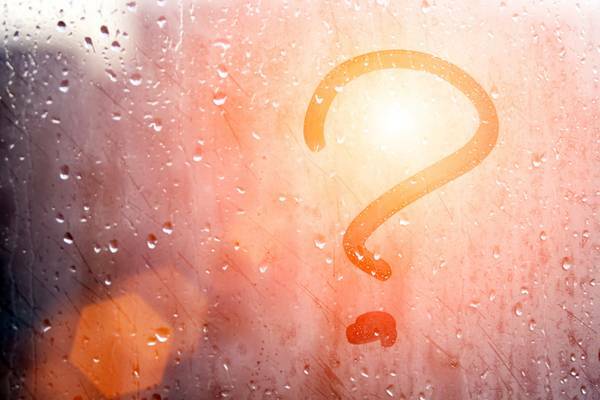 Since the start of the year is always a time for peering into the looking glass and attempting to glean the shape of things to come, one of our polls focused on Unbabel, the online translation startup that recently secured USD 23m in series B funding. We said in our report that it broke the dry spell in language-backed VC funding as the industry did not see major deals in 2017. 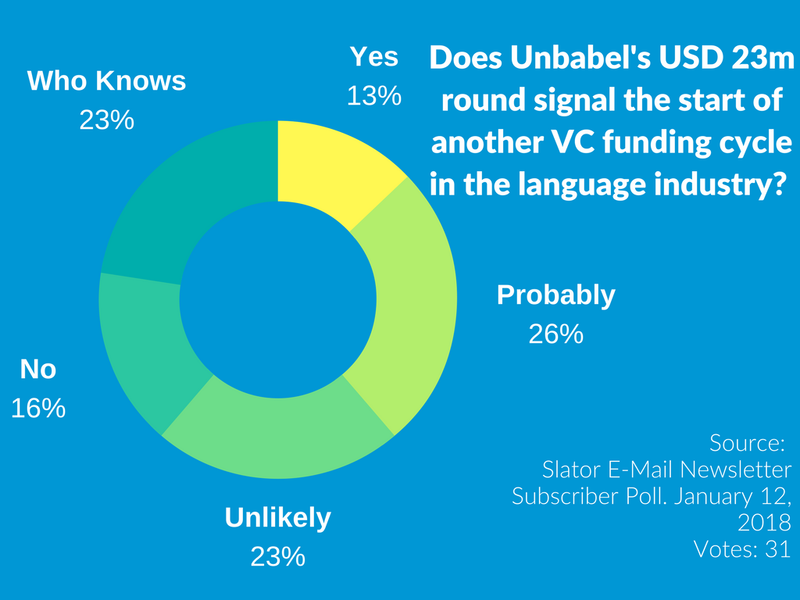 So we asked our readers: Does Unbabel’s funding signal the start of another VC funding cycle in the language industry? Most Slator readers are not certain about this. Almost a fourth (23%) answered “unlikely” and the same number of respondents (23%) said they do not have any strong opinion and answered “who knows?” Slightly more than a fourth (26%) of poll respondents said “probably.” Interestingly, there were more people who answered an outright “no” (16%) than outright yes (13%). This means that Slator readers are ambivalent on the issue of funding. It is obvious that Unbabel’s success is not seen as a clear precedent that may later snowball into a trend. Around the time it became public (thanks to court records) that H.I.G. Capital, owner of Lionbridge, was among the final bidders of TransPerfect, the embattled New York-based language service provider took the lead in the annual revenue horse race. TransPerfect finished the year with USD 615m in revenue, whereas Lionbridge’s year-end figure will be “just shy of USD 600m”, according to CEO John Fennelly. Only 6% of the respondents said “yes” and 8% said “probably yes,” while 17% are undecided. Yet, the language industry has yet to see NMT in more production environments. 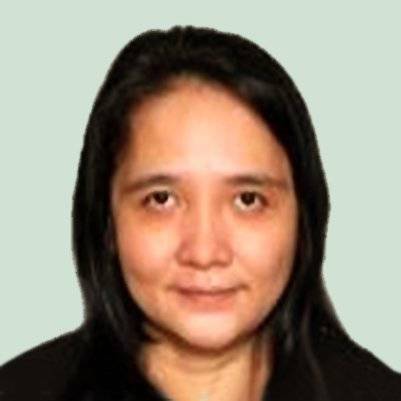 Despite talks that using MT can actually generate cost savings for translation buyers, it appears that MT may not really be in the customers’ radar yet. 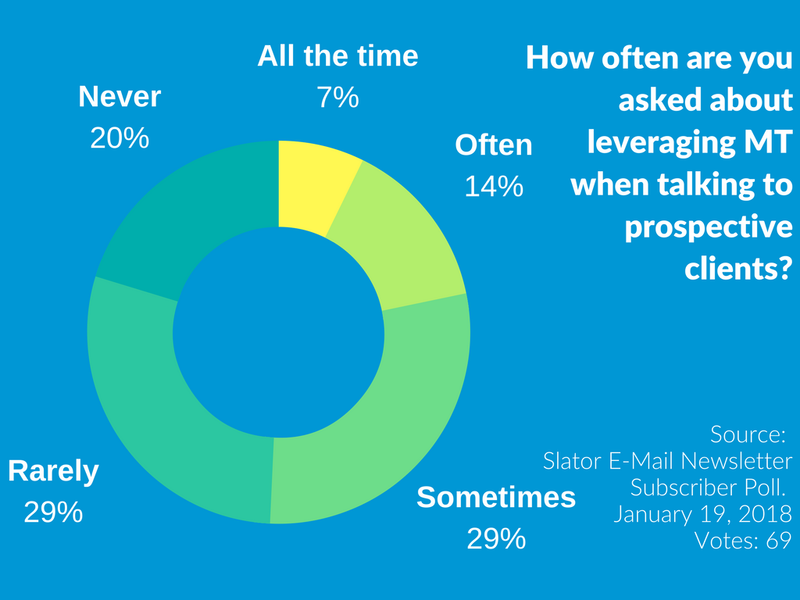 We asked our readers: How often are you asked about leveraging MT when talking to prospective clients? The majority said “rarely” (29%) and “sometimes” (29%). Another 20% of respondents said “never”. Only 14% of respondents said “often,” and only 7% answered “all the time”. 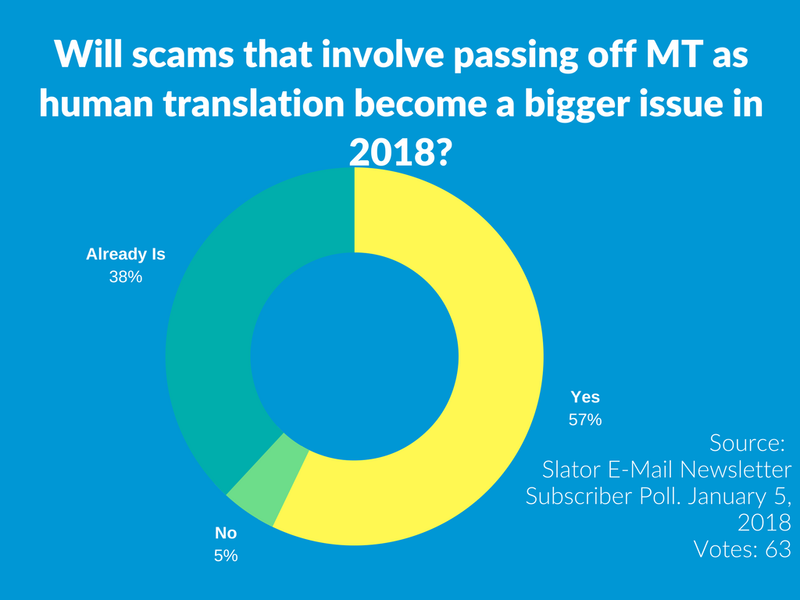 This indicates that translation buyers are not really looking into MT yet as a viable option, although this may change in a year’s time as MT develops further. Lastly, our newsletter subscribers are more concerned about scams involving MT. The question was triggered after we reported on a group who has exposed thousands of fake translator CVs being peddled to language services providers. Along with the CV scam comes the fraud of passing off machine translated content as human translation. As MT is improving fast, we wanted to know if our readers think this scam will become more prevalent. More than half (57%) of respondents believe that this scam will even be a bigger issue in 2018. Another 38% also said “it is already a big issue” now. Only 5% of respondents do not see this scam getting bigger in the next 11 months.